[Kevin Annett is pictured above from an archive file of a recent interview. The Directors of ExopoliticsTV met on Friday Dec. 19, 2014 and for the following reasons have decided to take all ExopoliticsTV interviews with Kevin Annett, sole spokesperson for ITCCS, offline until further notice. 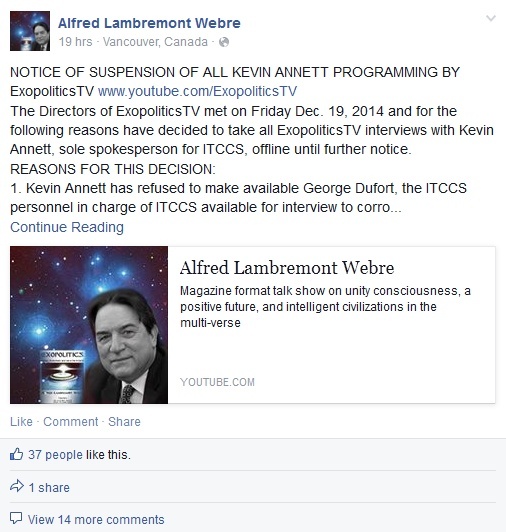 Kevin Annett has refused to make available George Dufort, the ITCCS personnel in charge of ITCCS available for interview to corroborate the statements made by Kevin Annett in interviews with ExopoliticsTV since Sept 14, 2011. 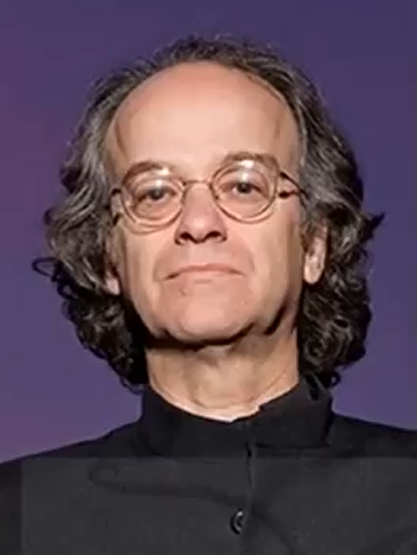 Because of the statement of ExopoliticsTV, Alfred Lambremont Webre [See below], there is probable cause to believe that fraudulent statements by Kevin Annett may appear throughout each of these interviews. ExopoliticsTV does not have the resources to edit each video for possible such statements at this time. ExopoliticsTV does not wish to be responsible morally, ethically or financially for broadcasting false and misleading information about the topics that Kevin Annett is addressing in his interviews. Public Health & Welfare – The issues addressed in Kevin Annett’s interviews are paramount to public health and welfare, especially of children and our institutions. AS soon as independent, corroborative evidence comes forward on the issues Kevin Annett has addressed, ExopoliticsTV will broadcast that evidence. I interviewed Kevin Annett as sole ITCCS spokesman for 3 years and I took on faith many statements he made because of my 10 year relationship with him at Vancouver Coop Radio. On Oct. 28, 2014, a woman friend of mine came to me with a report that Annett had been simultaneously romancing and proposing marriage to several women in different parts of the planet. I had also noticed that young beautiful women would be appointed administrators by Annett of the ITCCS Facebook group [which I had founded] who then would become traveling companions to Annett across Canada and to Europe. My friend told me that Annett was engaging in unethical interpersonal relationships with multiple women. By coincidence Annett was scheduled for an ExopoliticsTV interview in early Nov 2014 and I confronted him with what I had been told. Annett lied to me face to face as an ExopoliticsTV interviewer and Producer, saying he hardly knew my friend whereas they had been going out for 2 years. Annett then accused my friend, who runs a spiritual center, of being a government agent. At that moment as a broadcaster I lost trust in Kevin Annett as I sensed he was deliberately lying for deceptive media purposes. Within the past two weeks investigator Heather Martin published interviews with two women whom Annett was simultaneously romancing at the same time he was my friend and living a jet set international life style on proceeds he had obtained through breach of trust with yet another female ITCCS supporter who gave him a total of $150,000 for ITCCS that was misapplied to his personal lifestyle. I decided that as a matter of due diligence I should request an independent interview with George Dufort who Annett indicated had functioned as a coordinator of ITCCS Brussels. Over the past several months I had received emails purportedly written by George Dufort. I also knew that some researchers had concluded that George Dufort, like Jeremiah Jourdain, were fictitious persons Annett had made up in an effort to make his organization real. Upon my request of an interview with George Dufort, Annett escalated into a public hostile response indicating that I would be the target of a Tribunal and Grand Jury starting in January in Vancouver. Hence I issued a Protective Order to protect my home and the 10 people in it including elementary and secondary aged students from being threatened by the Grand Jury and Republic of Kanata gang, mandating no contact and prohibiting them from coming within 100 meters of my house. ExopoliticsTV has now developed and will be publishing evidence that Annett manipulated $150,000 from one such woman to support his lifestyle in the ITCCS, constituting fraud and breach of trust. NewsInsideOut.com has yet to receive verification that ITCCS Brussels personnel or the court exist. Moreover we have receive preliminary information impeaching one of Annett’s principal European witnesses. In the course of following through on due diligence we have been attacked and distorted by Annett and followers. Our working hypothesis is that one of the functions of ITCCS is to displace and discredit any genuine citizen offered in this field. Sadly, there are many more disguised angels that need exposing, I am talking about idolized gurus from religions to doctors and healers who are really disguised predators and parasites. They all need to be exposed in public for what they have done and continue to do. Until then the truth will not be revealed, allowing us to heal and create a world of prosperity. Oh! I have not heard that recording yet, I will listen to it today. Thank you for sharing, and thank you for being here! Many of the “awake” are still trusting that high profile people talking in opposition to the institutional establishment could not be wolves disguised as sheep, or they could not be covert agents; yes, “under cover”! More importantly, more so now than ever, is that we emphasize the skill to remain intentionally focused on disclosing the facts to assist in creatively freeing the People on Earth and exercising personal sovereignty. In this light, prominent people like Annett, and Heather does not derail the grassroots movements and spontaneous self organizing communities. We are exposing them with their dark secrets that maintain control and simultaneously we are creatively implementing alternatives that removes our support of their dark destructive policies. There are good people who have donated money and have been harmed by the deceptions, and it is these people who need to hear our emphasis on remaining focused on truth, and creatively exercising personal sovereignty. Common Law courts, Peoples’ Grand Juries, Aware/social Media, Community Farms, Complementary Currencies, Free/Open source, P2P Networks, and so much more are our efforts to exercise personal sovereignty and create global prosperity. Moments ago I listened to the broadcast recording with Kevin addressing the allegations with the intention to not address them but to rather dismiss them and focus on the issues of state. The interview, I am sad to say, is disappointing in that it was not a platform for disclosure but rather to dismiss the allegations and support Kevin to continue to disclose institutional atrocities, which is fine for that single issue, however a forum is needed to address the allegations against Kevin as a fraud and misappropriating funds. I agree Kevin should not be found guilty absent evidence of criminality. Thus, in the weeks ahead this will drag on into more controversy until evidence is verified as factual or as false. If anyone has contact with Alfred Webre then please encourage him to seek FULL disclosure and closure of this immediately. Do not drag this on. Disclose the evidence get the affidavits of victims, get Kevin’s response and affidavits, and then we can move beyond this pain and enter the remedy and healing phase. Many of the awake are still trusting that high profile people talking in opposition to the institutional establishment could not be wolves disguised as sheep, or they could not be covert agents; yes, “under cover”! We are exposing them with there dark secrets that maintain control and simultaneously we are creatively implementing alternatives that removes our support of their dark destructive policies. There are good people who have donated money and have been harmed by the deceptions, and it is these people who need to hear our emphasis on remaining focused on truth, and creatively exercising personal sovereignty. Common Law courts, Peoples’ Grand Juries, Aware Media, Community Farms, Complementary Currencies, Free/Open source, P2P Networks, and so much more are our efforts to exercise personal sovereignty and create global prosperity. Important disclosure. I really like the position you have taken. Thank you so much, and I know that many of us are resonating with truth disclosure, remedy and healing. When you set aside a few minutes please read the reply comment here from brother Thomas who experienced personal harm from Kevin Annett and his ITCCS. I wish both Kevin Annett and Alfred Webre Emails are overflowing with massive calls for the affidavits and factual evidence to be verified and disclosed immediately. This mess (more than about Kevin’s ITCCS, but other provocateurs as well) must be cleaned up, a necessary process, for us to move forward. From institutional governance to betrayed trust by advertisers, marketing, journalists, idols, icons, gurus, priests, financial advisers, politicians, and disguised agents targeting activists, unsuspecting and naive people. Oh my, What a Litany! Disclosures will eventually rout out the disguised villains, and agents, then massive advancements and healing for the People on Earth will manifest. Thank you for sharing this brother Thomas! I had not heard this story, and the mystery of why Mel Ve was, and still is, so angry with Kevin Annett is less obtuse as well. I am sad to hear of the loss Johan Joubert, and glad you have survived and persisted on this challenging journey. Perhaps, this time, Full Disclosure will out the fraud and misappropriations of donations and funds to remove this den of criminals. Signed affidavits and verified factual evidence will put an end to this, even before that I think some will choose to run and hide from their personal responsibility. Either way they will be gone from the public deception game and further attempts to derail the grassroots movements. Time for a email and social media campaign for both disclosure and closure of this ITCCS deception.